From the photo of Gudshon and Gubchevsky. View of the facade of b-ci from Aleksandrovskaya street (now - M. Grushevsky street). - The image is horizontal. 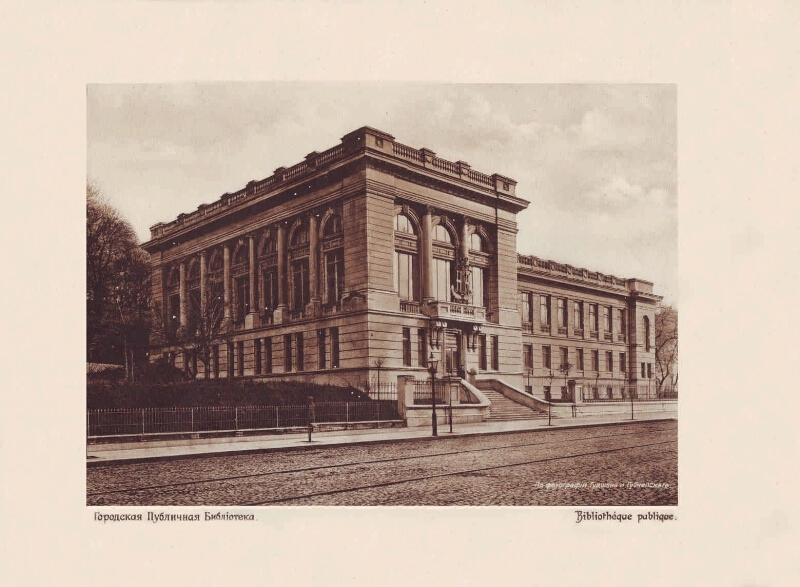 The building of the library was built in 1911 by architect Z. Klave. The architectural solution of the structure is characterized by functional and artistic-aesthetic unity. The asymmetric arrangement of the hull emphasizes its main volume, which houses the entrance, the lobby and a large reading room. The main volume is adjoined by an additional volume with a glass lantern of the upper natural light above the inside staircase. The main volume of the building is solved in the form of an order system with ionic columns that frame large windows with arched endings. The ground floor is treated as a high podium. The building is crowned by a mighty cornice and attic. The main entrance to the library, to which the original staircase leads, expanding to the bottom, is successfully solved. During the Great Patriotic War, the building was burned by retreating fascists (1943). It was restored in 1954. Now here is the National Parliamentary Library of Ukraine . 1. National Parliamentary Library of Ukraine (Kyiv, city, Ukraine) - Building - Photographs. 2. Territory of Russia (collection). 3. Russia-Ukraine: from the history of relationships (collection). 4. Architectural photographs.